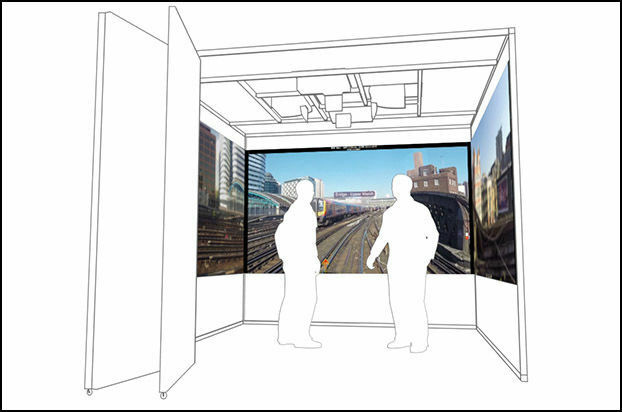 "[Mission Room's] immersive 360-degree VR displays are invaluable, especially on infrastructure projects such as railways, highways and similar, to examine designs and survey data collaboratively. It can mean the difference between being on time and on budget versus being delayed and overpriced." Our unique immersive visualisation products are a natural extension to the rapidly developing world of 3D Modelling. They provide you with a collaborative space to virtually walk through and rehearse complex digital models and BIM projects. Our systems easily integrate with a growing number of engineering products to provide you with an innovative shared virtual environment. Decrease risk and increase tender conversion using 360° immersive multi-screen displays or digital rehearsal rooms to deliver detailed project information. Virtually walk through complex projects and provide greater understanding. Using multi-screen displays to view 360° designs facilitates a greater understanding through improved visualisation. Our clients can remotely complete surveys, walk through existing digital data, track progress and improve collaboration by easily sharing the information cross functionally. Our immersive visualisation products provide clients with the ability to undergo a digital rehearsal of entire projects in a shared environment. This enables whole teams to collaborate more effectively, improving planning and reducing risk on projects. The use of the Mission Room's immersive displays improve visualisation across all stakeholders. Integration with a variety of digital construction software further enables multi-functional collaboration and deeper understanding of projects in real time. Our 360° multi-screen web browser enables you to take online content and display it across multiple screens with touch screen options, giving you a unique immersive experience. 3 x 3m cube offering a full 360° immersive experience, with footage projected on to all 4 internal walls, with touch screen options, you can stand inside your project or digital rehearsal room and walk through a variety of complex scenarios. A theatre style display for audiences of 30-40 people with touch screen options. The system enables you to turn any meeting into an immersive theatre experience. This super wide display system, that is configurable to fit any space, allows panoramic media to sit alongside other media such as maps to enable you to give an additional layer of context to your presentations and delivery. A mini version of the Open system, the desktop display gives you access to your panoramic 360° content alongside other media, such as maps, to give individuals or small groups that additional layer of understanding of projects and sites. The Air system is our newest portable display, which allows you to deliver content from any office or venue, but still give a unique immersive experience you would expect from a Mission Room product. The Portable system allows you to see more of your immersive content in context on the move. The system packs neatly away in to a wheeled case and is quick and easy to set up. 3D Repo and Mission Room are launching a new integration which will allow 3D Repo’s cloud solution to be used directly within any of Mission Room’s 360° visualisation products. Skanska use Mission Room visualisation products to display BIM data on the Woodlands school build. Following the successful completion of the M1-A5 Link Project, where Mission Room was used to assist with site induction, in 2019 a Hybrid System was re-instated on the M6 J13-J15 Smart Motorways Project for Kier Highways, working on behalf of Highways England.